The Rambler Battalion in formation after running reconnaissance drills in Oz Park on Nov. 8. 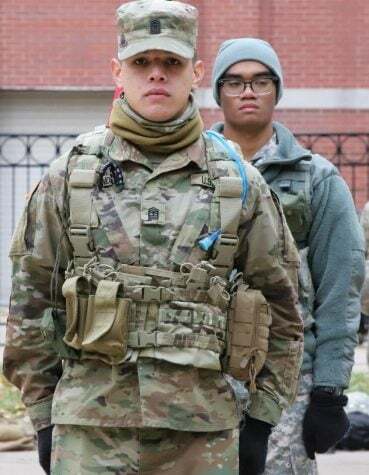 Weekly Leadership Labs allow the ROTC companies from the schools that comprise the Rambler Battalion – Loyola University, Northeastern Illinois University, North Park University, Northwestern University and DePaul – to come together as one. The sun rises over Chicago as over a hundred cadets in uniform stand at attention while the rest of the city sleeps. It’s 6:30 a.m. and the Reserve Officers Training Corps (ROTC) is getting ready to start tactical training in Oz Park. Early morning joggers and dog walkers move throughout the open field as soon-to-be soldiers practice war games. Cadets can often be spotted walking around campus in a black shirt and shorts that simply say “ARMY” in bright yellow or in full uniform heading to class. At other times, they blend seamlessly with the civilians around them as active members of Greek life, sports and other student organizations. But what exactly do ROTC students do at DePaul? And perhaps more importantly — why? The ROTC program at DePaul includes just under 40 students, all of whom comprise the Bravo Company. Cadets are required to maintain at least a 2.5 GPA and they must pass a physical fitness test that includes running, pushups and situps. Throughout the program cadets are taught the fundamentals of a successful career as an officer in the Army. 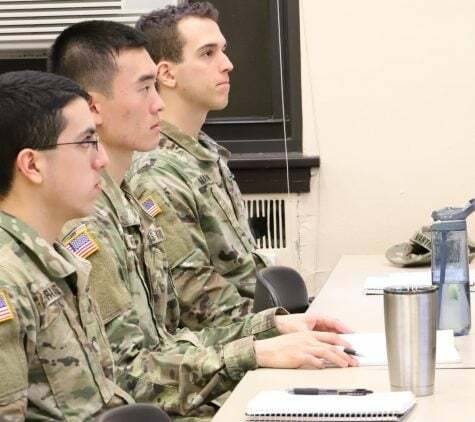 In the classroom, cadets learn the qualities of an effective leader, problem solving and decision making and how to handle moral and ethical dilemmas in war. Sgt. 1st Class Jorge Sabillon is on active duty and teaches the first-year cadets. “It’s very general material, just giving them a brief overview of what they’re getting themselves into and the traditions that follow it,” Sabillon said. Freshman year, cadets learn the ropes of what it takes to be in the Army including identifying rank, basic map reading and land navigation skills as well as a brief history and a look at what role the Army plays today. “For the sophomores, we get more into the nuts and bolts of leadership and team building. 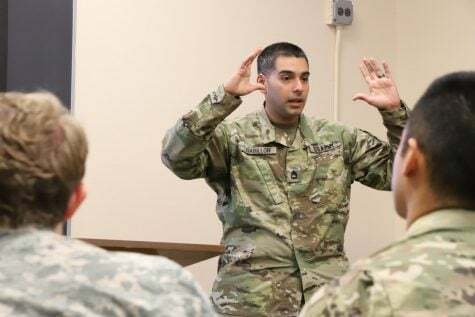 Then we get a little more at the intermediate level with their tactical skills like land navigation and basic infantry tactics through battle drills,” Lewis said. “The Army usually does training in what we call ‘Crawl, Walk, Run’ so I would say freshman year is the crawl phase, I start teaching the walk phase and by the time that they’re juniors they have to start running,” he said. Between a cadet’s junior and senior year comes “Advance Camp,” 41 days in the summer where they are evaluated on how well they’ve been trained here at DePaul to determine if they’re ready to take a leadership position as an officer. Many cadets commission for four years of active duty service in exchange for a full scholarship with others opting into eight years of service in the Army Reserves or the National Guard. This essentially provides complete job security for cadets pursuing active duty service upon their graduation as a second lieutenant, or an officer, in the Army. Hands-on leadership training comes in large part from Field Training Exercises (FTX) wherein the cadets go to a local military base, live in the barracks or in the woods and put into practice the things they’ve been learning. The weather is often cold and rainy, adding another element to build character. These trips also serve as a tool for cadets to see what might be in store for them in the future as a member of the military. In addition to the practical skills learned during the year, cadets are given the opportunity to get more specialized training including AirBorne, Air Assault and Jungle. 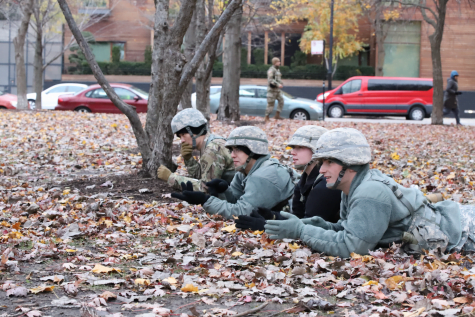 Four cadets practice recon techniques in Oz Park. Due to the limitations of being in a major city, much of the training must be supplemented by imagination. With daily workouts starting promptly at 6:30 a.m. and weekly Leadership Labs off-campus on Thursdays at 6 a.m., sleep management plays an integral role in success as a cadet. And while on paper the time commitment seems feasible, additional events like charity races and special training opportunities are almost always on the schedule, making ROTC much more demanding. For many of the cadets, time management has proven to be one of the biggest challenges. “If you let it, ROTC will definitely take over your life if you don’t manage your time correctly,” Hudson said. Cadet by cadet, they discuss any struggles they might be facing and as a group, they strategize about how to help them overcome their hardships. “As soon as those red flags pop up we can show those people some love, give them the help that they need so they can overcome those tough situations,” Lewis said. Michael Lenckos is a third-year cadet platoon sergeant and was selected to run PT for fall quarter this year. Lenckos joined ROTC later than most but found a family in his fellow cadets. The commitment also encompasses a community of like-minded individuals all with similar goals and a high level of determination. For many freshmen, that close-knit community bond can be incredibly appealing. With that said, involvement in ROTC can affect other aspects of the college experience. In such a large city, many people’s exposure to military life is confined to their interactions with cadets in uniform. For many students, the transition to college is difficult enough and a major commitment to ROTC freshman year may not be wise, said third-year cadet Maria Marrugo. 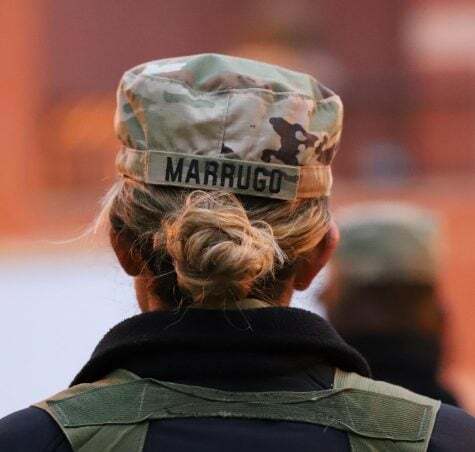 After doing JROTC at her high school in Florida, Marrugo took a break her freshman year at DePaul to determine what she wanted moving forward. This also allowed her to settle into her own at college, find her friends and become more comfortable away from home. The following year, Marrugo joined ROTC. I have gathered a lot of informative information imvu hack online from your blog thanks for the information .